After a construction period of 14 months, the cruise line NCL took delivery of its latest treasure Norwegian Gem from Meyer Yard in Germany. This brand new ship is the sister ship to Norwegian Pearl. With the introduction of the new fleet member, NCL is on target to have the youngest fleet in the industry by the end of 2007. Travel agents and journalists had the chance to spend a night on board at the beginning of October to discover and embosom this new "It-Girl". Arriving at the port of Rotterdam on 4th of October 2007 we instantly recognized the new NCL cruise resort by her distinctive hull artwork, featuring an eye-catching array of colourful gems tumbling from the bow to almost the middle of the ship. With a crew of 1.154, Norwegian Gem can accommodate 2.400 guests (double occupancy) and has all the top-of-the-line amenities guests have come to expect from NCL, including a four-lane ten-pin bowling alley, rock climbing wall, two top-of-the-ship Deluxe Owner's Suites and the new Wii video game system by Nintendo - a ship offering facilities and cabins for nearly every taste. On board Norwegian Gem guests find thirteen different restaurants without set dining times and opening hours from 5:30 pm to midnight (seating until 10:30 pm). Thus, they can choose when, where and with whom to dine. 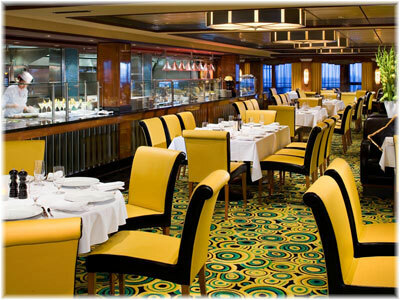 In fact, guests can dine in a different restaurant each night of their cruise, if they like to. Should they however prefer to dine at the same table and/or at the same time every evening, reservations may be arranged on board accordingly. 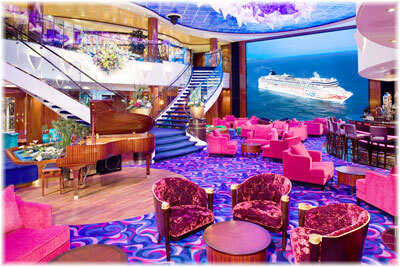 Norwegian Gem features a restaurant seating guide, displayed on flat-screen televisions placed in key areas on the ship. They show each restaurant's current occupancy status as well as possible waiting times. If a restaurant is fully occupied at a certain time and guests would like to wait for an opening, they will get a pager that works all over the ship informing them as soon as the table is available. 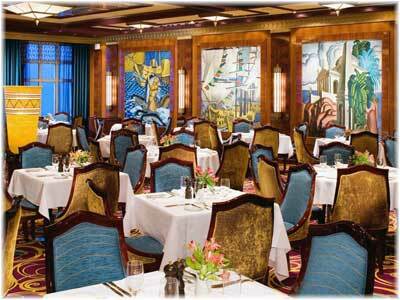 Located on Deck 6: It is an elegant dining room inspired by grand ocean liners that accommodates 558 guests. Art deco light fixtures and dark woods help depict the grandeur of that golden age. Located on Deck 6: Floral backlit artwork with decorative walls boasting fabulous blues and magentas are dominating the restaurant. This restaurant is a modern area using lighting to create an exclusive ambience. 304 guests can be accommodated here. Located on Deck 8: The "Tequila" is a southwestern desert themed restaurant with a large colourful mural portraying horses, cacti and the exotic agave plant. Hot and cold tapas are served for 96 guests. Located on Deck 13. 160 guests can choose between delectable steaks ranging from filet mignon to a 16-oz, T-bone as well as grilled tuna, corn-fed chicken, veal and more. This restaurant is an art deco themed steakhouse from the 1930s. Located on Deck 7: This modern Asian restaurant with a sushi/sashimi bar and a Teppanyaki room (20 $) is vested with wood carvings and wall panels featuring Tibetan monks. A backlit stained glass form the backdrop. 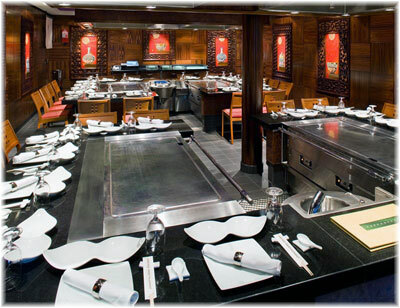 Guests (108 in the Orchid Garden and 34 in Teppanyaki) experience delicious Japanese, Thai and Chines dishes. Located on Deck 6: Le Bistro with place for 129 guests is a theatrical Art Nouveau restaurant reflecting all things French. Wine displays surround the entrance and the artwork, including an original piece by Henri Matisse, celebrates famous French icons throughout French history. Located on Deck 8: A 24-hour diner with a coffeehouse setting features everything from hamburgers and fish and chips to fast wok dishes and shepherd's pie. The Blue Lagoon accommodates 94 guests. Located on Deck 12: Is an action station casual restaurant where NCL chefs cook fresh foods like seafood, pizza, fruit, soups, pasta, burgers and desserts. 390 seats are available for guests. The Garden Café includes a Kid's Cafes with small seats and tables. At the Great Outdoors, guest can enjoy fresh air and a breathtaking view with their meal (259 seats). Located on Deck 12: Italian restaurant reflecting an eclectic, Tusan style atmosphere including grapevine covered columns and traditional furniture from Italy. 96 guest can enjoy fresh salads, pizza, made-to-order pasta, authentic Italian desserts, fine wines and espresso drinks. accommodates 144 sunbeds, 314 chairs and 14 stools (including Topsiders and The Grill). There are various hot tubs conveniently located throughout the ship. The full service beauty salon and spa offers a wide range of spa treatments to rejuvenate the passengers. There are numerous ways to stay in shape while on board. The Body Waves Fitness Center is open 24 hours with a full gym and aerobics/fitness classes daily. Large department store offering a wide selection of branded and choice items. Located on 5, 6 and 7 Deck; accommodates 1042. It's showtime! Enjoy Broadway and Vegas-style shows. Located on Deck 6; accommodates 327. Located on Deck 13; accommodates 24. This on-board chapel also functions as a meeting room. Located on Deck 6; accommodates 11. Located on Deck 7; accommodates 11. Located on Deck 12; accommodates 34. A quiet place to write postcards, play cards or read a book. Located on Deck 12; accommodates 24. A well-stocked selection of things to read with all the elegant trimmings a good library deserves including a stellar view. Located on Deck 12; accommodates 28 and 6 computers. Get into the zone of fun because the Kid's Club is just for toddlers with a wall of windows for viewing kids, and an indoor jungle gym/obstacle course. Located on Deck 12; accommodates 58. This is a cool place where teens can have fun, too. Located on Deck 12; accommodates 37 machines. Located on Deck 6; accommodates 60. 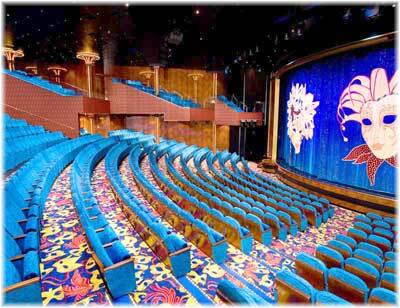 Aboard Norwegian Gem guests can choose from a wide range of cabin categories to suite every taste and budget. Available stateroom categories include for example well-appointed inside staterooms for price-conscious customers, outside staterooms with private balcony as well as the largest and most luxurious suite complex at sea. This includes the unique Courtyard Villas which have access to private courtyard, swimming pool and sun deck as well as two Garden Villas, featuring three separate bedrooms, bathrooms and a living room. Both butler and concierge service. Garden Villa - Spectacular 4,390 sq ft Garden Villa complete with living room, dining room and three separate bedrooms each with king- or queen-size bed, private luxury bath. One bedroom also features a full bath with whirlpool tub and separate shower. Butler service and concierge available. Access to exclusive concierge lounge and private courtyard area with pool, hot tub and sundeck. Sleeps 6 adults, plus room for 2 rollaway beds and 3 cribs. Owner's Suite - With over 790 sq ft, these suites include a living room, private balconies, dining room, separate bedroom with king-size bed, mini bar and luxury bath and separate shower. Access to exclusive concierge lounge and private courtyard area with pool, hot tub and sundeck. Butler service and concierge available. Courtyard Villa - Living area, private balcony, dining area, separate bedroom with queen-size bed, separate children's bedroom, one bedroom features a luxury bath and separate shower. Access to exclusive concierge lounge and private courtyard area with pool, hot tub and sundeck. Butler service and concierge available. Penthouse - Living area, private balcony, dining area, separate bedroom with queen-size bed, separate children's bedroom and luxury bath and separate shower. Butler service and concierge available. Romance Suite - Designed for romance, these suites include a living area, private balcony, dining area, bedroom with queen-size bed and luxury bath and shower. Butler service and concierge available. Oceanview Stateroom with Balcony - Two lower beds, sitting area, floor-to-ceiling glass door opens to private balcony. Inside Stateroom - Two lower beds. NCL Corporation Ltd. is an international and innovative cruise company headquartered in Miami, Florida, with a fleet of 14 ships. The corporation oversees the brands NCL Freestyle Cruising, NCL America and Orient Lines. In October 2007, the company took delivery of the new built Norwegian Gem. In addition, NCL plans to build up to three new third generation Freestyle Cruising ships for delivery between 2009 and 2011. 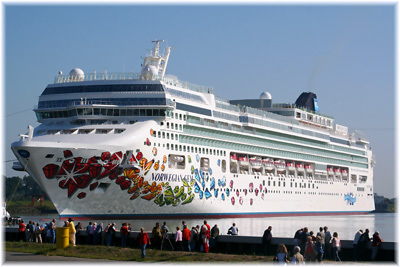 NCL is on target to have the youngest fleet in the industry by the end of 2007 with the introduction of Norwegian Gem. The Continental Europe Branch of NCL is headquartered in Wiesbaden. In 2000, NCL introduced Freestyle Cruising - an innovative way of cruising, especially designed to meet the changing needs of today's cruise passengers in every respect, whether in terms of dining, attire, entertainment or service. With Freestyle Cruising, NCL offers its guests a more relaxed, resort-style cruise product with complete flexibility and non-intrusive service of the highest standard. NCL is the only cruise line whose entire fleet is exclusively based on the Freestyle Cruising philosophy.